Northport Nursery School has been serving the community as a cooperative preschool since 1941, offering classes for children ages 2 through 5. A non-profit, non-sectarian organization, our school is registered with and follows guidelines established by the New York State Education Department. Families are an integral part of our cooperative program. Northport Nursery School gives parents the opportunity to take an active role in their child's nursery school experience. All member families participate in the classroom approximately once a month, and serve on a school committee. When participating in the classroom, parents shadow their child throughout his or her school day. This allows parents the chance to observe their child in a hands-on, group learning environment. Our uniquely nurturing community is supported by our committees and various social events for both parents and children throughout the year. Non-participating status is also available for parents who are unable to commit to volunteering in the classroom or on a committee. Our teachers and assistants are well-qualified, caring individuals passionate about early childhood education and sensitive to each of their student’s needs. Classes are grouped according to age, and have a dedicated teacher, teacher assistant and participating parent. All staff hold CPR/AED certification and re-certify annually. There is a maximum class size of 14 children for the 3-year-old classes and 18 for the 4-year-old classes. Northport Nursery School’s well-maintained facilities are set on 2.5 acres of wooded land and include our own building, an outdoor classroom, a spacious playground and a walking trail. Our classrooms are bright, airy, and located on the ground level. Each classroom has an art center/easels; wooden blocks; texture/sand table; library center; dramatic play/dress-up/housekeeping corner; puzzles, games and manipulatives; toy shelves with vehicles, animals and buildings; individual cubbies for personal belongings; and its own bathroom. Our completely fenced-in playground provides ample space for exploration and gross motor development. It contains a rubberized bicycle path and safety surfacing under all climbing equipment. 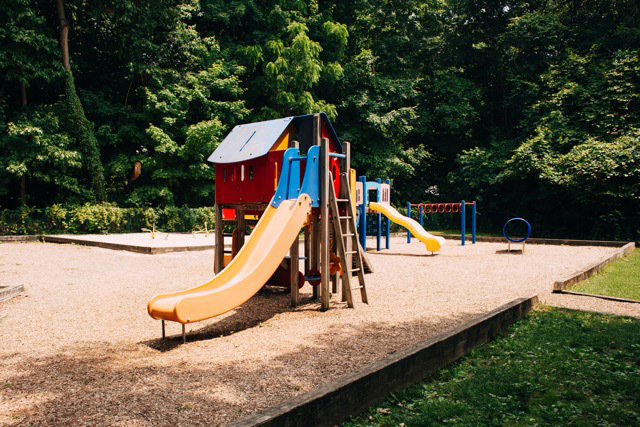 Play areas include oversized sandboxes, bicycle-go-round, swings, a large selection of ride-on toys, climbing equipment geared for preschoolers, and dramatic play structures.